Famous for being the "Capital of Alsatian Wine", and the birthplace of Frederic Bartholdi (you know, the guy who made the "Statue of Liberty"), Colmar is renowned for its well preserved medieval town, and its numerous architectural landmarks. 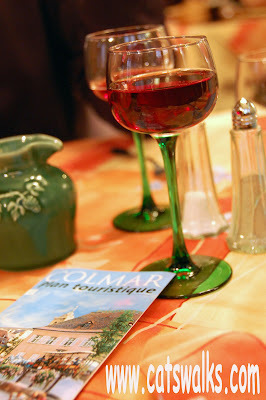 Personally, I find the region of Alsace very intriguing because it is a melting pot of German and French cultures. 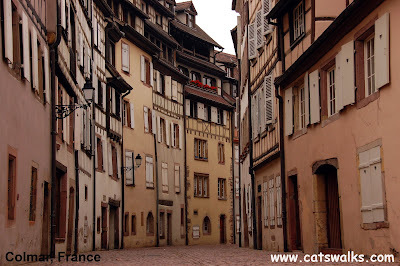 When we arrived in Colmar, it felt familiarly German with a French twist (the buildings are framed in wood but in pastel pink) . 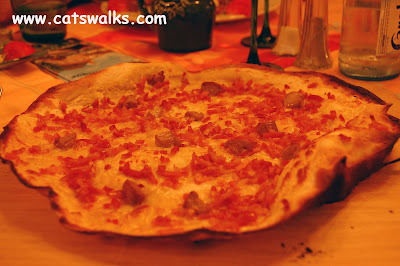 We tried flammkuchen (Flemkusch in Alsatian) with foie gras (very French) and Sauerkraut. Historically, Alsace has been bounced back and forth between Germany and France many times although the region has been mostly French in modern times. The Alsatian dialect is closer to German (sounds very much like Swiss German). Unfortunately, it is endangered because it is spoken by less less people as the younger generation prefer to speak French. Unfortunately, France is on holiday every time we try to visit. This time was no exception. So, everything was closed when we arrived and I guess only the most touristic restaurants were open and so I have to admit that I didn't like the food very much. The wineries were closed as well. I was so much looking forward to trying and buying Alsatian wines. We do plan on going back one day to get the full experience. It is afterall only about an hour from Basel.